Fire to the Prisons magazine acts a forum for conversation and news related to the international insurrection that plays out everyday on so many diffirent fronts. We hope to use this site as a source for more up to date news regarding resistance to the state, and repression conducted by it. Fire to the Prisons magazine is also avialble for viewing and purchase on this site. Please explore the links above for more details. 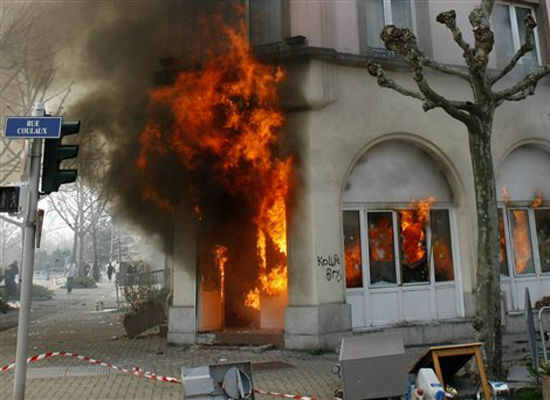 Hundreds of protesters attacked police and set a hotel and customs station ablaze Saturday in this historic Alsatian city on the German border chosen by NATO summit organizers as a symbol of European unity. An AP reporter saw police in body armor and helmets hoisting shields as they were pelted by several hundred protesters with rocks, sticks and then Molotov cocktails.About 100 officers responded by lobbing concussion grenades and volleys of tear gas into the crowds of demonstrators, many dressed in black and wearing masks or balaclavas. Around 85 people were arrested on Wednesday after repeatedly clashing with police in the narrow streets of London's financial quarter on what protesters designated "Financial Fools Day. By mid-afternoon on Thursday, after two police raids on squats and two smaller demonstrations around the Stock Exchange and the Bank of England, the total number of arrests reached 122, police said. French workers burned tires, marched on the presidential palace and held a manager of U.S. manufacturer 3M hostage Wednesday as anger mounted over job cuts and executive bonuses. Rising public outrage at employers on both sides of the Atlantic has been triggered by executives cashing in bonus checks even as their companies were kept afloat with billions of euros (dollars) in taxpayers' money and unemployment soars.